Jake, along with his father and sister. Troop 50 gained its second Eagle Scout in as many months when Jake Jerome passed his Eagle Board of Review. Jake served as the founding Senior Patrol Leader of the troop and is now the Assistant Patrol Leader of the Anonymous Patrol. 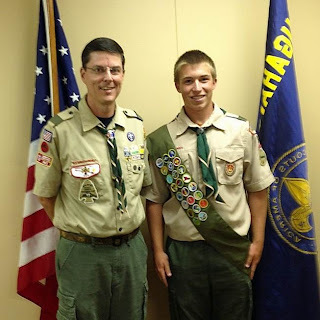 He joined scouting in 2002 as a Tiger Cub, with his father, John, serving as his first den leader. For his Eagle service project, Jake built seventeen wooden lockers and installed them at the Auburn Tennis Center on Samford Avenue. Please join me in congratulating Jake on a job well done! In addition to the two Eagle courts of honor we now have forthcoming, the troop is celebrating the approval of an Eagle project for Ethan and potentially another Eagle board of review and project approval next month. We also have three scouts about to appear for their Tenderfoot boards and a number of other advancements to award at our court of honor on Sunday. Congratulations to everyone for their hard work and commitment to Scouting. 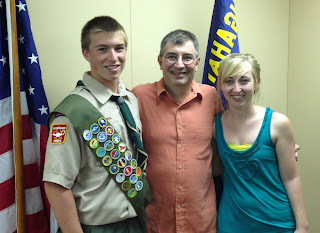 Jake with his former Webelos den leader and current scoutmaster.